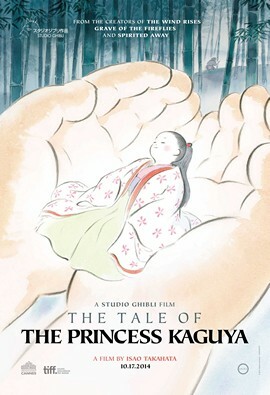 This movie, based upon the 10th Century Japanese story, "The Tale of the Bamboo Cutter", centers around Kaguya, a girl which was found inside a bamboo shoot by a bamboo cutter. The girl is raised by the cutter and his wife – who rapidly grows into adulthood. In time, great wealth is bestowed upon the family, so much that the bamboo cutter buys himself a title, and making the beautiful Kaguya a princess. And with that wealth comes all sorts of suitors, all of them wishing to marry the girl. However, all that Kaguya wants is a return to their simple life – and the young man that she loves.